There are two versions of the Latio in Singapore. The CVT one will rev higher during acceleration, to around 3500-4000 rpm using a low gear ratio. At super highway speeds this is likely to be at a lower rpm than usual, because the extra torque from the Surbo means a higher gear ratio is engaged. The other version is 4AT, which enables revving to 5500 rpm or higher easily with part throttle. 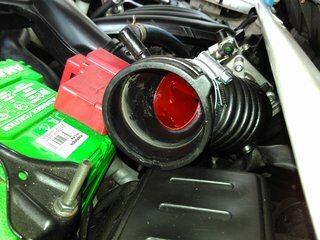 Photo below shows Surbo installed on Nissan Latio. The air filter will be put back afterwards.